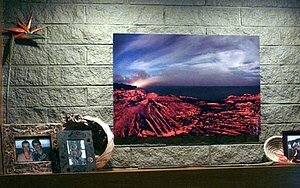 If you've purchased one of my images and want to let others know what you think of the print, this is the place to let everyone know. Feel free to include a photo of how you displayed the prints either with you or without. I will post them on this page. If you've been a client you can also send me your testimonial here. Examples are maybe I guided your production crew or your a publisher that has done business with me. It could be licensing or photo shoots. Above are samples of a few who have purchased prints and to the right is one from a production shoot I worked with back in 2007. I enjoy hearing from my customers and clients so, feel free to send me your comments and photos. 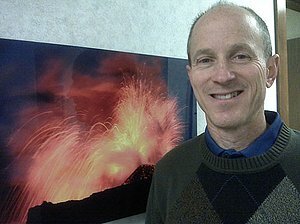 "The lava explosion image on metal looks great in the patient area of my office"
"This wonderful photo looks great on our mantel. The print quality is amazing on the aluminum sheet. It seems to have a glow of its own, even when under low light. 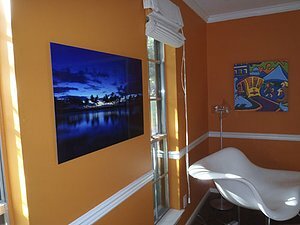 The print is light and easy to hang. We will enjoy this for a long time to come." "We love the Twilight at Waikoloa metal photo. I have had in all over the place: over the fireplace, in the entry etc. but right now I have it in the dining room that I am using for a library. I love the way the vibrant blue pops off the orange walls. And as the sun goes down the lights in the image glow just like twilight. The metal process is amazing and makes such a great piece of art. I am so glad we got the larger size. And we always turn it over for close friends to see your signature and outline of your hand. They love your story! Thanks for such a great memento of a special place."